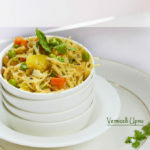 Vermicelli Upma a popular south indian breakfast and north Indian appetizer/snack.Loaded with vegetables and tempered with kadi patta / curry leaves and mustard seeds is a light but filling snack. 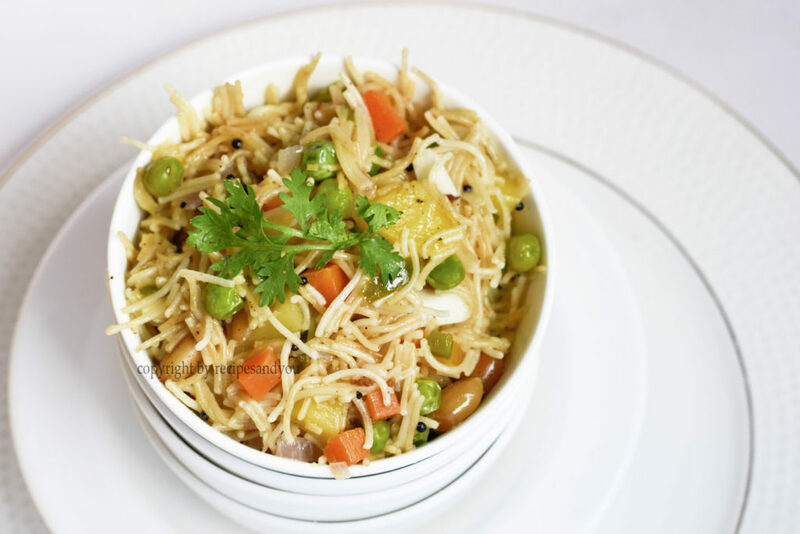 Also know as Semiya Upma, is a adaptation form the popular south indian breakfast recipe of Upma. 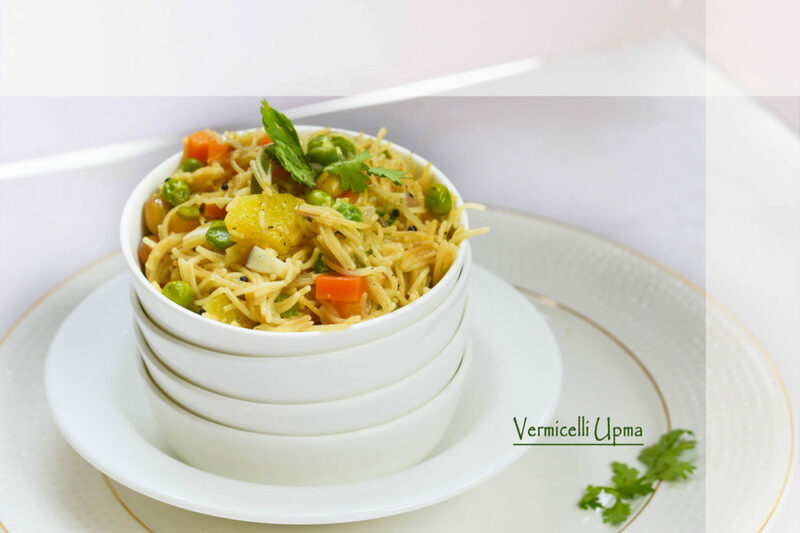 Upma traditionally made from semolina and cooked with various vegetables is a healthy as well as easy to digest breakfast recipe.In this recipe we make it with vermicelli. This recipe may have originated in the south of India, but equally loved in most parts of the country. Cook it with you favorite preferred vegetables and enjoy a lovely breakfast. Its good to keep your weekly menu of breakfast fresh and rich with healthy breakfast options.Keeping your breakfast options varied keeps it interesting and also rich in nutrition. You can even plan a weekly menu,like we plan and it also helps me to keep the Kids Lunch box ideas interesting and welcome by my fussy eaters. Here are a few ideas: Beetroot Burgers , Mushroom Baby corn Poha , Broccoli poha Idli , Hash brown Fried eggs with garlic cheese, Sabudana , Kadi Parantha , Wholewheat Broccoli Parantha/Flatbread with Flax seeds & seasme and beetroot curd , Italian Parantha , Sweetpotato Bread. My kids and family loves it. I like semolina Upma and vermicelli Upma both likewise. You can add as many vegetables as you wish. My personal favorite are potato , carrot, beans, green peas onion and for the lovely crunch fried peanuts too. These days i add roasted seeds like sunflower seeds and flax seeds too.I just dont feel by breakfast complete with the seeds added to it.But if you dont like the addition of seeds then please omit. Its completely optional. So try this amazing breakfast and do share you views in the comments below. Your comments inspire me to think and churn fresh new ideas and recipes. Heat oil in a pan. Add mustard seeds and dry red chillies and asafoetida (if adding). Add the onions and cook till golden brown. add the vegetables and cook until golden brown or half done.Add all the spices and green chillies. Add the kadi patta/ curry leaves and roasted vermicelli. Saute for 2 minutes and then add water. On high flame let it come to one boil. Then simmer, and cover till all the water evaporates and vermicelli get cooked completely. Before serving add the fried peanuts and lemon juice. This looks so flavorful! I would not guess that this would be a breakfast food, but I’m really liking that idea. Yum! I never thought of having something like this for breakfast, but it sounds so yummy and healthy. Oh great. Do share with us on our page. Am so glad you liked it.Thanks for liking it. I love how versatile this recipe is. I can see how it would be a treat breakfast or lunch or snack. This is my favorite breakfast anytime.Loved your recipe. This looks delicious! I was in India a few years ago and ate something like this and have been trying to figure out what it was since. Thank you for sharing! Glad you liked. Do try and share with us. Thanks . I have to say this looks a lot healthier than my usual breakfasts – I’d feel amazing getting that many veggies in first thing in the morning! It is indeed healthy.We love it and sometimes we also make it with our evening Tea.A great combo. This would be a great way to start the day! Absolutely.Its really a healthy way to start your day. Glad you liked it. This looks like such a fun flavor combo – I’m always looking for more ways to use curry leaves! Hey thanks.It is a great combo indeed.Do try it. I’ve never heard of this dish, but I love all the ingredients used. Looks like I found a fun new recipe to try! Do try and share your views. Thanks a lot. I’ve never tried this but it sounds so tasty and so versatile, thanks for sharing it. Looks delicious! I’ve never tried this before, but it looks amazing! Thanks Christine.Do try it is delicious and healthy.